The Plastic Soldier Company has made quite a splash in the wargaming community with its new line of plastic miniatures. 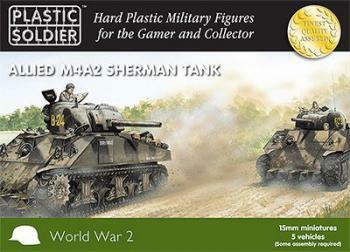 They are producing a line of excellent vehicles, figures and guns in 15mm, 28mm, and 1/72 scale. For us the first question we had was, ‘How do they compare to Battlefront’s vehicles?’ We liked the Forged in Battle line but it did not scale very well with Battlefront and of course were still resin and metal. Having all plastic miniatures not only saves a bit of money but they are far easier to work with as well. We grabbed a few boxes of the PSC 15mm minis to see for ourselves. The plastic casting quality is outstanding with almost no flash and only minor mold lines on certain parts. 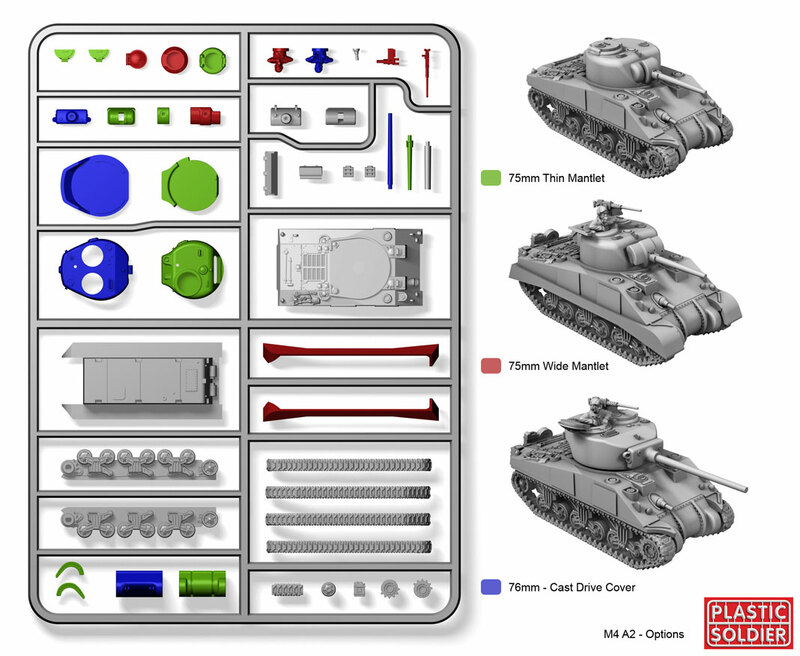 In the case of the Sherman, and all of the other tanks released so far, the track assemblies are in four pieces per side including: The main bogey assembly, a final drive sprocket and top and bottom track pieces. This is as finicky to assemble as it sounds. With the Sherman the track halves fit well and just a tiny bit of putty was used to fill the seam in the tracks but you could probably even skip this without worry. 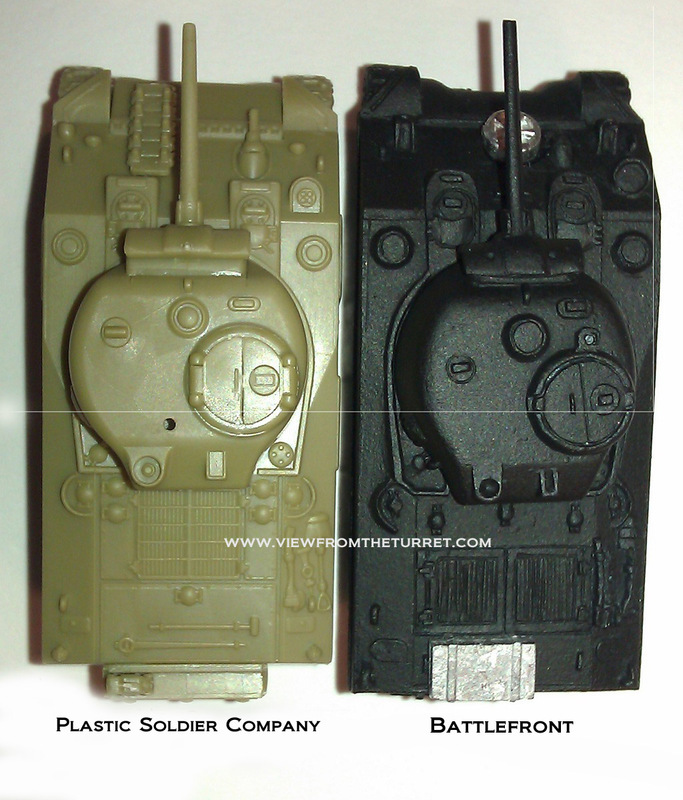 Why PSC did not produce single piece track assemblies like Battlefront has is a mystery. But compared to the work needed for BF metal tracks the PSC Sherman is much easier to work with. Compared to a BF tank with plastic tracks it is probably more work. But not having to worry about the resin is nice and the detail on the PSC Sherman is extremely crisp. Others have commented that the plastic tanks are simply too light once finished and we can see where they could move around on the table a bit simply because they lack mass. We simply glued a couple lead fishing sinkers in ours to give them some heft. 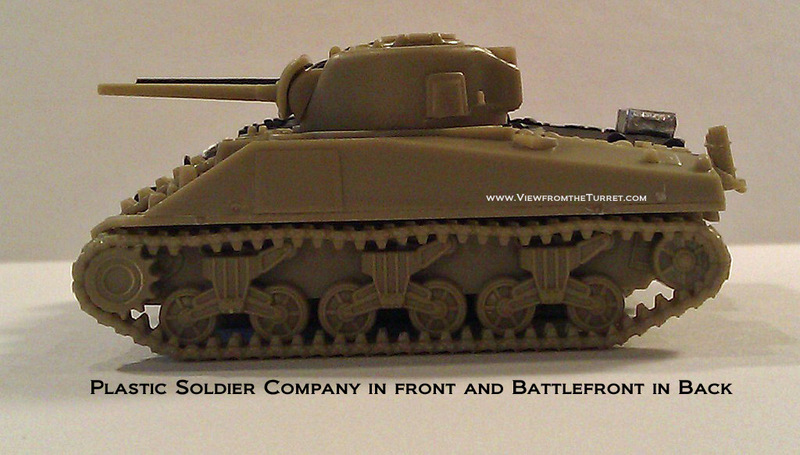 Overall the Plastic Soldier Company Sherman is of excellent quality and assembly time is just fine but could certainly be improved in the future with different design. You can also see a look at the MKIV kit assembly. 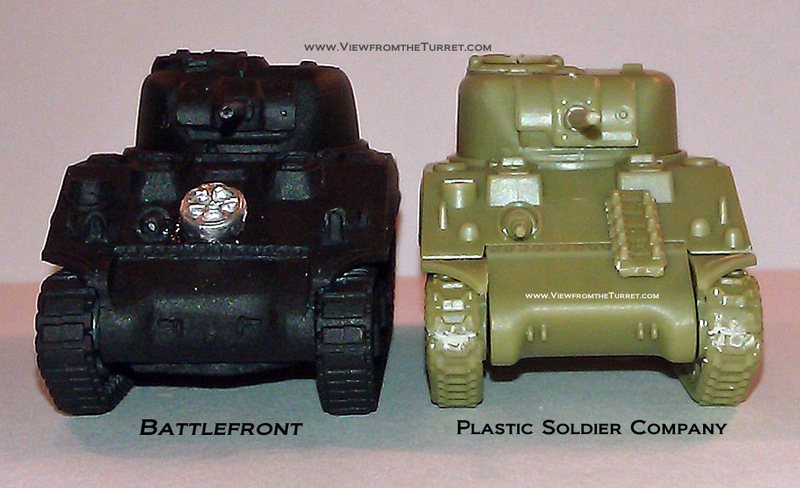 We are happy to report that the Plastic Soldier Company Shermans scale very well with the Battlefront vehicles. As you can see from the accompanying photos the PSC Sherman is a few millimeters shorter in length at the back deck and maybe 1 mm shorter in height. But unless the two miniatures are placed directly side-by-side it is almost impossible to notice the difference. Checking reference photos against the back deck on the PSC Sherman it does in fact look a touch short or the rear idler wheel is a bit far out. But again, from a practical standpoint you really can’t tell the difference. With luck we hope this size comparison will apply for the other vehicles as well. The 15mm German infantry are also very well cast with a nice variety of poses. They are a bit slighter (more realistic) in build but still look ok with the Battlefront figures but we doubt you would want to mix them on the same stand. The biggest problem is that the PSC heads are a lot smaller than the Battlefront heads. Many think BF figure heads are too large but the PSC heads almost seem too small. They almost seem scaled properly as a head but not as a head wearing a helmet. So with the infantry which to choose is going to come down to personal preference. Our guess is those assembling large infantry forces may opt for PSC but some folks will certainly prefer the character of the BF figures. Sherman PSC and BF Side Comparison. Note they are practically the same size. For gamers this is a real win as you now have some choices. If you do prefer plastic you can happily use the PSC products where possible. We recommend you give them a look for yourself. Sherman PSC and BF Top Comparison. Note the shorter back deck on the PSC. Also see our look at the PSC SdKfz 251D Halftrack. This entry was posted in 15mm, Flames of War, Miniature Wargames, News and Updates, Reviews, WW2.